Connection ports for various cables and accessories are found under the covers on the left side of the camera. Microphone jack: If you’re not happy with the quality provided by the internal microphone, you can plug in an external microphone here. The jack accepts a 3.5mm microphone plug. USB port: One way to download images to your computer is to connect the camera and computer via the USB cable provided in the camera box. The small end of the cable goes into this port. HDMI port: You can connect the camera to a high-def (HDMI) television via this port, but you need to buy a Type C mini-pin HDMI cable to do so. Headphone jack: To enable you to monitor movie audio, you can attach headphones via this port. Your headphones need a 3.5mm plug. 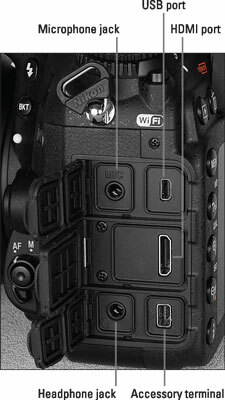 Accessory terminal: Here’s where you attach the optional Nikon GP-1/GP-1A GPS (Global Positioning System) unit, the WR-1 and WR-R10/WR-T10 wireless remote controllers, and the MC-DC2 wired remote ­control. I don’t cover these optional devices, so refer to the manuals that ship with them to find out more. If you turn the camera over, you find a tripod socket, which enables you to mount the camera on a tripod that uses a 1/4″ screw, plus the battery chamber. The other little rubber cover is related to the optional MB-D15 battery pack; you remove the cover when attaching the battery pack. Along the side of the battery cover, a little flap covers the connection through which you can attach the optional AC power adapter. The camera manual provides specifics on running the camera on AC power.